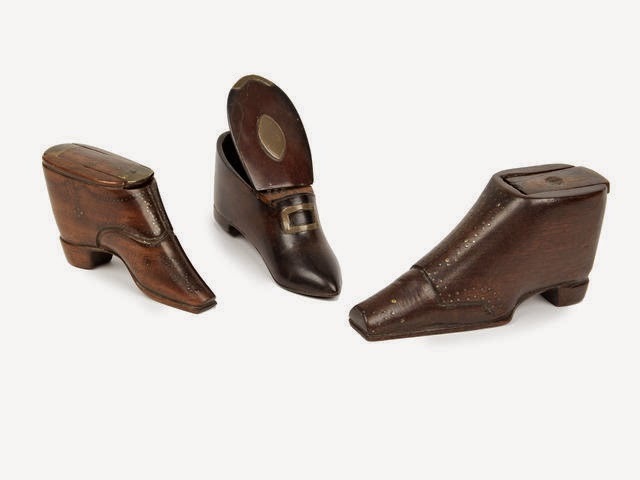 A colleague recently called my attention to this charming fruitwood token of a Victorian boot, up for auction at Bonham’s. (http://www.bonhams.com/auctions/21835/lot/341/) According to sources, this may well be a wedding or love token. Certainly, the significance of shoes with nuptials is a long standing one, and, on this particular example, the object has the added detail of the heart on the toe. 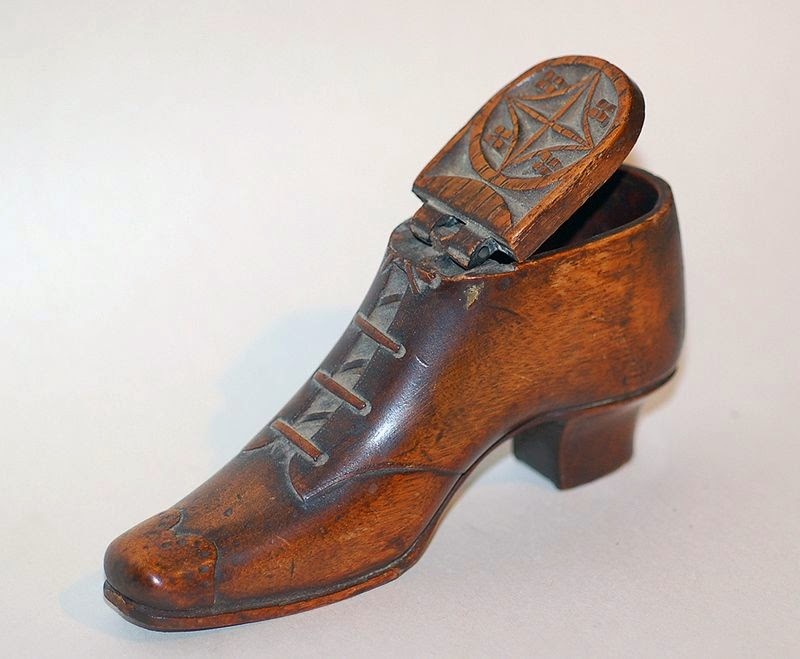 Given the "style" of the wedding boot, with its low heel, "spat-like" toe treatment and the ornamented boot top, it would be appropriate to the mid or late19th century. 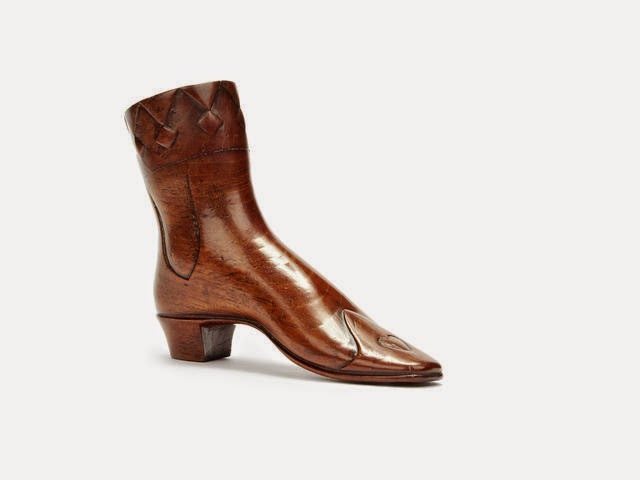 However, the treen shoes, while giving a sense of their respective time period through styling, wood type and details, are imaginative. Treen – which literally means "of a tree" -- is a generic name for small handmade functional household objects made of any number of types of wood. Not being too familiar with this type of collectible, I did a bit of searching and found a number of absolutely delightful treen snuff boxes in past auctions at Bonham’s and in museum collections. The use of treen snuff boxes will parallel its popular use, with late 18th-mid 19th century examples. Several are featured below. E.H. Pinto (1901-1972) brought scholarly attention to the now highly collectible treen. Pinto began collecting when he was a boy and wrote the definitive book on the topic. The Birmingham Museum & Art Gallery purchased his collection of over 7,000 items in the 1960s. Thank you to my colleague, James Burrough, Director, The Real Wood Furniture Company, for calling my attention to the Victorian love/wedding token at Bonham’s.